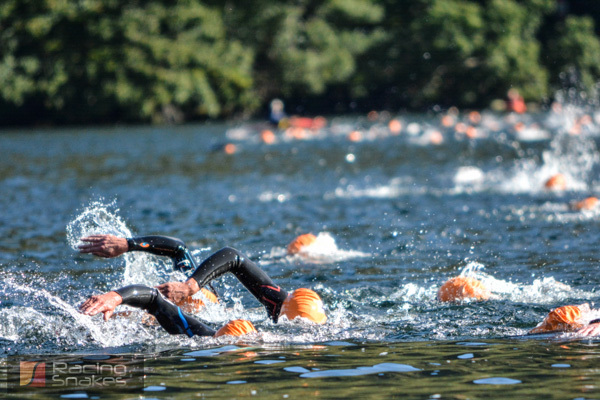 The Wasdale tri, start off’s off with a 1.2 mile swim in the coldest lake in Britain (technically it’s not a lake! ), even with a wetsuit and a couple of swim hats this is a cold swim, but it does say Wasdale triathlon is hard. At least the bike must be easier – wrong, its a brutal ride over Hardknott Pass and Wrynose Pass, Hardknott Pass has a 33% gradient and is the steepest gradient road in England, Wrynose isnt far behind with 30% gradient. The Wasdale tri, is brutal, and to prove it you head down the road around Neaum Cragg, back over Blea Tarn and do the Wrynose followed by Hardknott Passin the opposite direction. I will surely get some good photos of the riders suffering! as they climb these passes. After the 56 mile bike leg the Wasdale triathlon goes on to the next stage – surely an easy jog around the lake shores of Wasdale – wrong. 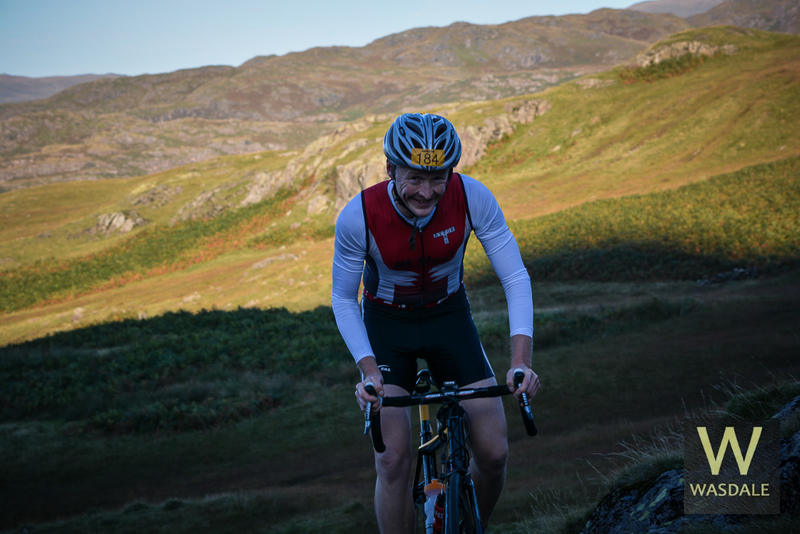 The Wasdale Triathlon organiser has a mean streak, he is sending the runners up high into the hills along the corridor route to climb Englands highest Mountain Scafell Pike. 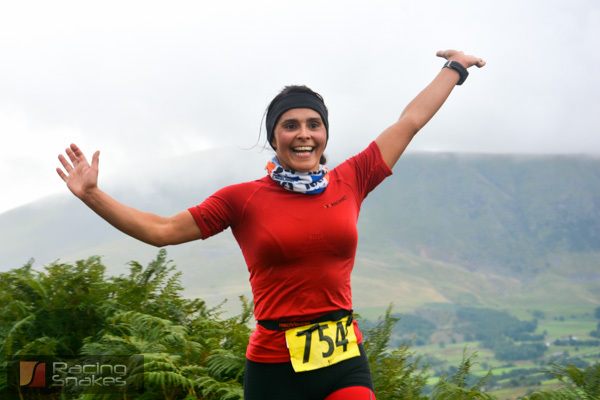 This is a hard fell run of 13.1 miles and after the swim and bike will be telling on the legs, the steep sided hills will surely bring on the dreaded cramp. 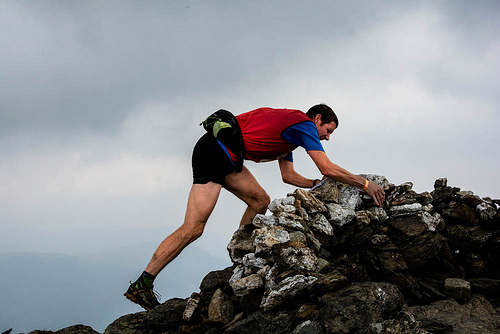 The run returns and the Wasdale Triathlon finishes at the North East end of Wast Water. This entry was posted in Triathlon and tagged tri photos, Triathlon photos, Wasdale tri photographs, Wasdale Tri Photos, Wasdale triathlon photographs, Wasdale Triathlon Photos on September 24, 2013 by racingsnakes. 3 peaks cyclocross photos. On Sunday 29 September 2013 I was planning to be taking pictures / photos of the 3 peaks cyclocross. This will not now happen as I received a last minute booking to photograph the Wasdale Triathlon event, Sorry I will be missing the race, but I am really pleased to have been booked to take photo’s of the hardest half ironman in the world! Last year I took photos of the three peaks cyclocross in terrible conditions, there was a strong wind blowing a Hooleyand the rain was torrential, preventing rain on the lense was a challenge. It was a tough day for all the riders and the marshalls.The 3 peaks cyclocross pictures from 2012 can be seen here. The race will start from Helwith Bridge, North Yorkshire at 09:30am (on the outskirts of Horton in Ribblesdale). 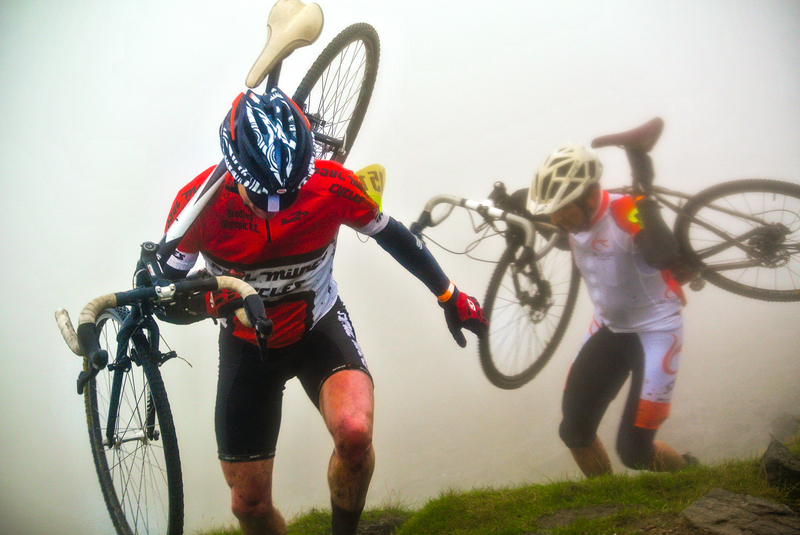 The three peaks cyclocross race is being billed as the toughest and longest cyclocross race in the UK if not the World, and few would argue against this. The 3 peaks cyclocross race is 38 miles long (61 kilometers) with 5000 feet of ascent (1524 meters). The riders first head out from Helwith Bridge through Horton in Ribblesdale and head towards the Ribblehead viaduct before turning off towards Gill Garth Farm, this first section is controlled by the race directors car, and all riders must follow the car. After here the race starts proper, the hill kicks up and there is an evil climb up the side of Ingleborough, which includes getting over a stile. Once Ingleborough is summited the riders descend to coldcotes. This section has bike eating bogs, and often a rider can be seen after flying through the air bikeless! From Coldcotes the 3 peaks cyclocross riders progress on the road to just before the Hill Inn, a left turn is taken along an asphalted farm track towards the next off road section at the foot of Whernside. The three peaks cyclocross riders will the be carrying their bikes up the steep off road section, up stone steps on the rough track before the fitter riders get back on their cyclocross bikes to ride along the shoulder of Whernside and start the descent. The descent is for the brave, the track has drainage troughs running diagnally across the track, along with slippy stone flags. More than one rider will puncture going down here, and there is usually a gathering of wheel men (support crew, with spare wheels at hand) at the bottom of the descent for the quick wheel change. The 3 peaks cyclocross riders then pass under the famous and impressive Ribblehead viaduct, before rejoining the road to head back to Horton Ribblesdale. One more hill to go, this is an out and back for the cyclocross riders, up Penyghent and back down. Often you will see close calls here! By this I mean a slower rider struggling going up hill with a racing snake descending at full speed and meeting on a corner! Once back down to the road a couple of miles sprint back along the road to finish line at Helwith Bridge. This entry was posted in cyclocross, Uncategorized and tagged 3 paeks cyclocross photos, 3 peaks cyclocross, cyclocross, cyclocross yorkshire, three paeks cyclocross, three peaks cyclocross photos on September 19, 2013 by racingsnakes. Pictures / Photos from the Tour of Britain 2013 stage 2 race over Honister Pass can be seen on Racing Snakes. 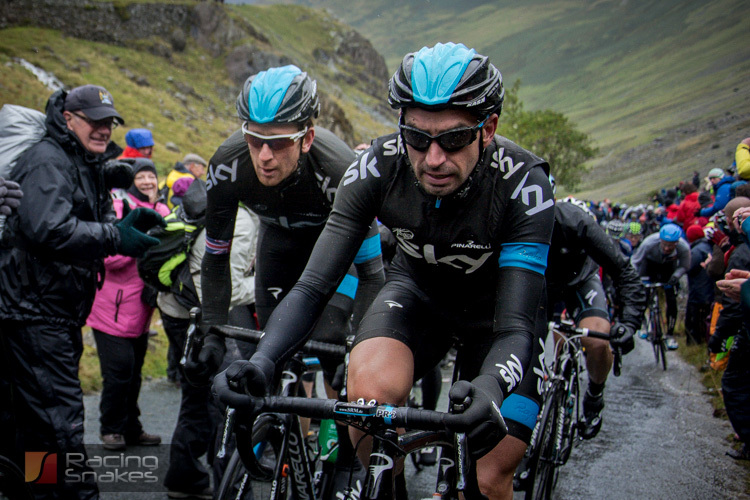 On Monday 16 Septemebr 2013 the Tour of Britain also known as the ToB was held in Cumbria. 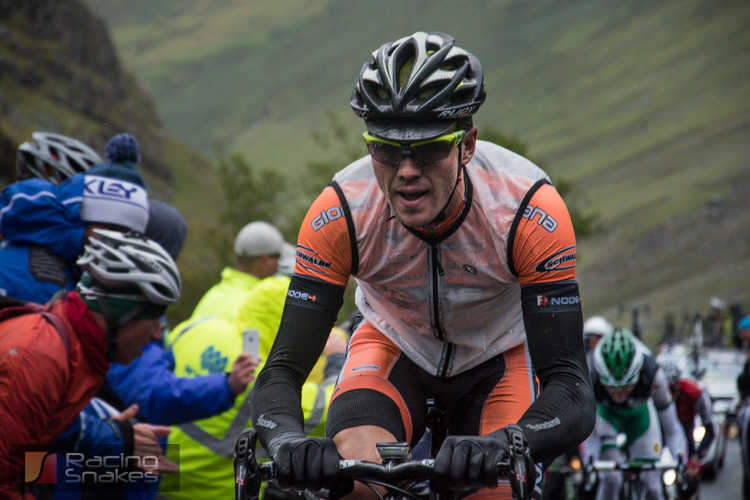 Armed with my camera I headed to the King of The Mountains stage at Honister Pass to capture the race in photos. The forecast was horrible, high winds, heavy rain showers or wintry showers, it didnt dissapoint! The only blessing for the Tour of Britain riders was that there was a tail wind pushing the riders up the Honister Pass. I wanted to capture photos that were ‘gritty’ showing the pain in the riders of the Tour of Britain as they headed up towards the summit of Honister Pass. The Tail wind was good news for the riders but bad news for the photos, an event photographers nightmare, the rain would be blowing straight into the lense of the camera, making the photos blurred if water hit the lense. In a race like this you only get one chance to get a photo, and on Honister pass there is also big crowds all jostling and encouraging the ToB riders, the spectators are a lively bunch and wont politely stand to the side whilst you set up a tripod and camera, and righfully so, that’s why I love this sport, you can get close and personal to the riders. I took my camper van up early to make sure I got a parking space close to the summit of Honister pass. I was going to be there a while and the non ending supply of tea and food was going to make the long day in horrible conditions a lot more bareable. The Tour of Britain race was due to reach the summit of Honister around 1pm, I arrived at about 7.30am. On arriving early I took the dog and camera out for a walk to take photos on the hills from Fleetwith Pike. A good view of the Tour of Britain route can be seen from here, twisting its way up the Buttermere valley from Cockermouth (or on a good day with clear skies), I took some photos but dindn’t hold much hope as the weather was not being kind. After the walk I returned to the van for refreshments and watched the steady stream of spectators climbing the Honister Pass on their bikes from both directions. 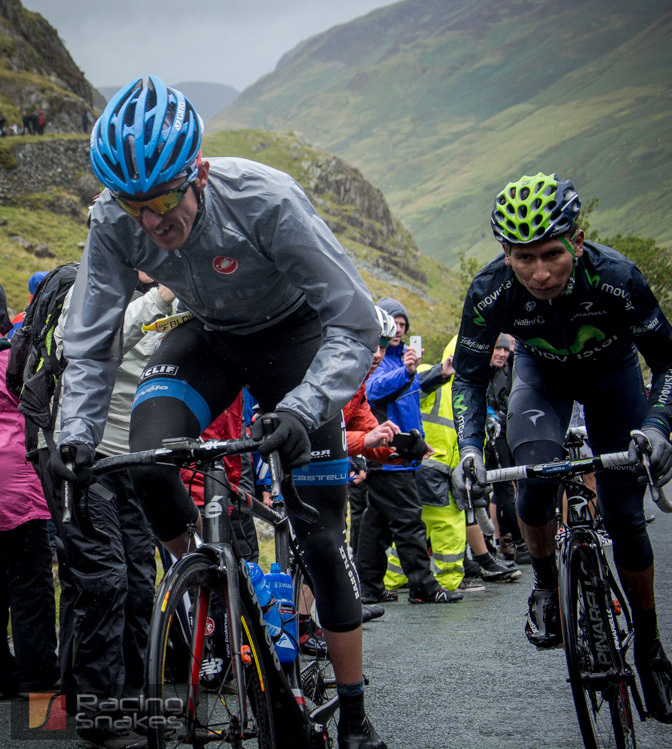 The tour of britain was to tackle Honister pass with its 25% gradients. I found a spot that would be at one of the hardest point of the climbs, 200 meters before the summit of Honister Pass, this should be a great spot to capture the best photos. The next hour was pretty uncomfortable with the high winds and torrential downpours as we awaited the first of the riders. As the first of the riders arrived I croutched down with camera set on a fast shutter speed and snapped away trying to capture photos of the faces of the riders as they stared at the road 2 meters in front of their front wheel. There was lots of jostling with other spectators and once or twice I had to lean out into the path of the riders to get the perfect photo. This entry was posted in Uncategorized on September 17, 2013 by racingsnakes. On Saturday 14 Septemeber 2013 I took photos at the Buttermere Tri. Buttermere Triathlon photos 2013 links can be found at the bottom of this post. For me this was a first, I have not previously taken photos at a triathlon. It turned out to be fantastic day, the weather was very kind, good for the race and good for the photos. Over 200 competitors turned up for the Buttermere Triathlon, the event centtre was at Buttermere, the race organise/director is Ian Mulvey from High Terrain Events. I know Ian from old when we used to compete against each other at Adventure Races. There were a few faces I recognised, but mostly I had not come across these guys and girls before. The lake was flat calm with swirls of mist around hugging the lower parts of the Mountains.The first leg of the tri was a swim was on Buttermere. Two buoys had been inflated and the swimmeres set off in a clockwise direction heading diagnally across the lake. There was an impressive amount of kayaks on the lake offering water safety coverage. It was a mass start and an impressive sight to see 200 swimmersstarting off together, two swimmers soon got an early lead and looked impressive, the water conditions were calm and kind to the athletes. The homeward leg on the swim for these triathletes was cold, this is where the entry stream brings in the cooler water and by this time in the race the adrenaline is subsiding and the cold is felt much more. Once out of the water there was a 200m run to the transition area, A quick change on to the bikes, the first 200m wason a farm track and care was needed not to punctureon the lead up to the road. The first couple of miles is flattish running at the side of Buttermere before the first of the big climbs on he bike stage, Hoinistor Pass, this hill kicks up 25% in places. I had run back to the van and drove to the top of Honistor after seeing the first swimmers finish and just got there in time to see the lead riders summiting the col (two days after the tri, the Tour of Britain is scheduled to ride this mountain pass). The riders then descended in Borrowdale andtraveled down the side of Derwentwater and made their way to the foot of the next climb Whinlatter pass. Again this a tough long climb particulalry on tired legs. After this follows a long descent into Lorton and back along the Buttermere valley. I had positioned myself on the side of Crummock water with the idea that I could photograph both the riders from this area, allowing for the fast racing snakes who were nearing the end of their race to be photographed alongside those still finishing the last two miles of the ride. The final event of the Buttermere Triathlon was the run which circumnavigated Crummock water. The West side of the lake has a rough track which to many triathletes is quite alien. 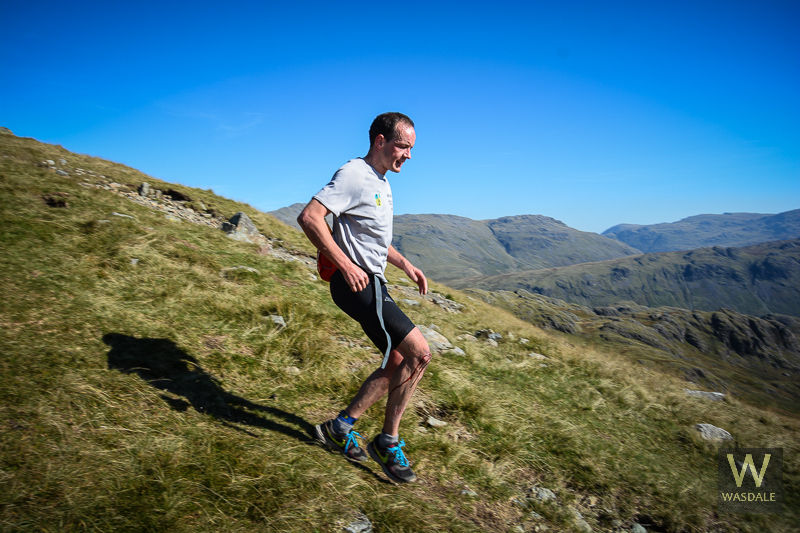 The run route is flattish howver with less than 2 miles to the end there is a sting in the tail with the run Climbing Rannerdale Knotts, as hort steep climb with steps that triggers the cramp for the runners. This entry was posted in Triathlon and tagged buttermere traihlon 2013, buttermere triathlon photos on September 15, 2013 by racingsnakes. 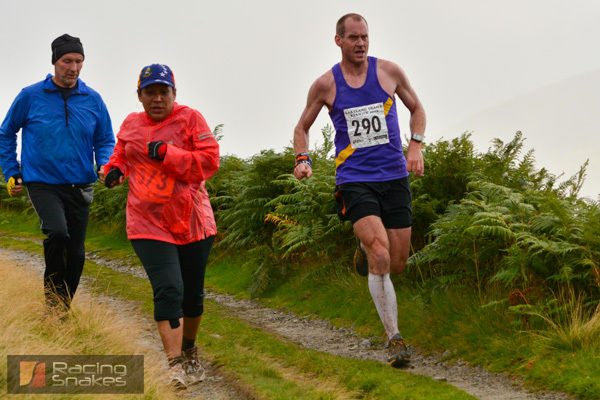 On Saturday 7 September I went to photograph the Lakeland Trails 15km races. There were a number of races being held as part of the Lakeland Trails event, these included a fun run, a 10km race, and two 15km races. The races started from Fitz Park in the centre of Keswick in the lake District. The 15 km route took the racers along the old railway line to the East before the climb of the foothill of Blencathra, heading up towards Skiddaw House. The track met the Cumbria way where the runners then headed South on the homeward leg. This offered the runners great views over High Rigg, The Dodds and Helvellyn. The final part of the run was to skirt around Latrigg before the descent into Keswick and the welcome finishing banners set up in Fitz Park. The 15km races were set off in two waves, the first wave setting off at 1pm and the second an hours later. The racers were given either a yellow race number (1st wave) or a white number (the 2nd wave). This made for some interesting photos as the faster racingsnakes from the second race were overtaking the slower runners from first race. The weather was mixed to say the least, the slower runners on the second race got the best views of the day as the sun tried to break through the clouds. I placed myself on the descent down to Whitbeck, this promised to have a great backdrop to the South. If the sun was going to shine it might cause a few problems but that was unlikely today! The problem challenge of the day was keeping the rain off the lense, the lense hood helped a bit but a brolley would have been the best option. It was great to see so many runners having a great time, and thanks for waves and the friendly banter. I do hope the guy that was walking down the hill made it back safely!! I asked after his well-being on seeing him walking, he replied “I cant run”, I said there was a medic round the corner, to which he replied ” I dont want a medic, I want toilet paper”! Perhaps a new piece of manadatory kit for the FRA rules? This entry was posted in Trail Running on September 9, 2013 by racingsnakes. FREE Sports Photography for your customers. That’s got your attention! Probably the best way to promote your event is to employ a photographer. People love to see pictures of their friends, or for the more vain, themselves :-). A sports photographer will come along for a fee, snap away on their digital SLR and at the end of the day you have hundreds of photo’s of your event to do as you please. If you choose to share these with your customers for free via the likes of facebook it becomes a very powerful marketing tool for your next event. For every photo that gets tagged it is seen by that persons friends, the average facebook user now has 190 friends, thats means each person tagged is potentially seen by 190 potential racers (and thats without photo shares), add your logo to the event, encourage likes on your page and you have a great marketing tool. That’s just the start, with other social sites like twitter, instagram etc. along with your blog and website and you soon get the idea of just how valuable a sports event photographer is. To get the most out of your investment in a sports photographer you should get someone that not only knows photography but also knows about the sport and racing (that’s me!!!). It’s no good employing a sports photographer that is out of breath looking at a hill never mind climbing one with heavy kit on his or her back, if all the action is taking place up on the hills. As a racer I know the likley best lines the racers will take, ensuring I am at the right spot with camera in hand rather than stood 500m away looking in the wrong direction. 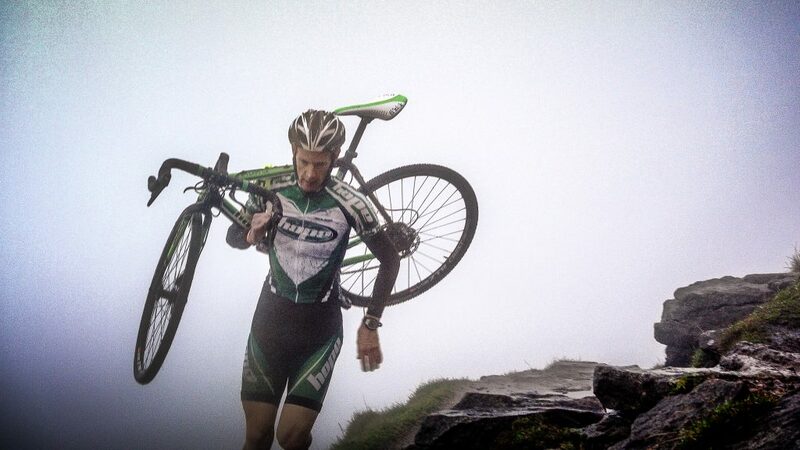 I have plenty of experience in adventure racing/ fell running, mountain biking, ultra running and navigation events. I will come along to take your event photography, taking high quality sports photographs of your event for a fixed fee (hourly rate + travel). Post event I will use lightroom to enhance the photo’s and add logos/ branding as required. I can offer advice on marketing and getting the most from the photographs. Introductory offer of only £130 for full day (£70 half day). For a chat or to book contact for; mick@racingsnakes.com leave me your contact details and I will call to give you more details. 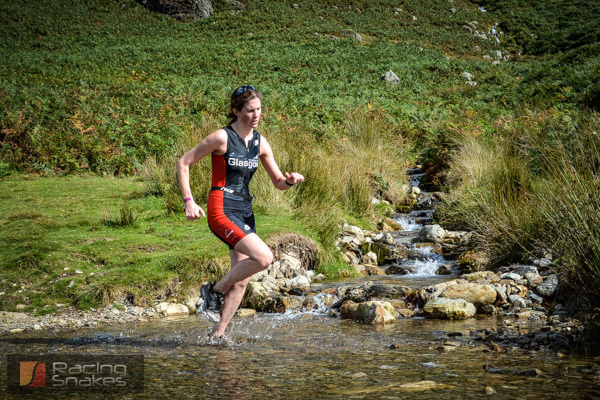 This entry was posted in Adventure Racing, Cycle Sportive, Fell Race, Mountain Bike Orienteering, Mountain Marathons, Trail Running, Ultra Running, Uncategorized and tagged adventure race photography, event photography, fell racing photography, free event photography, mountain bike photography, photraphy, running photography, sports event photography, trail race photography on September 4, 2013 by racingsnakes.